First, the ES adds to its wheelbase and width, but also looks more masculine with its giant spindle grille and more muscular nose and front fender styling. The tested F Sport blacks out the spindle grille while tweaking the front and rear bumpers and adding 19-inch darkened chrome wheels. From a performance perspective it adds adaptive variable suspension and engine sound enhancement (pumping some engine sound through the car’s stereo speakers) and offers five drive modes all the way up to Sport S+, which boosts engine revs and seriously stiffens steering effort. All that won’t make you feel like you’re in an Audi or BMW, but it adds a smidge more kick and excitement to an already fine luxury sedan. There are three other trim levels that all aim more solidly at the luxury end of luxury sedaness, plus a hybrid model is available in the various trims. Here’s the scoop on power, which is generous. 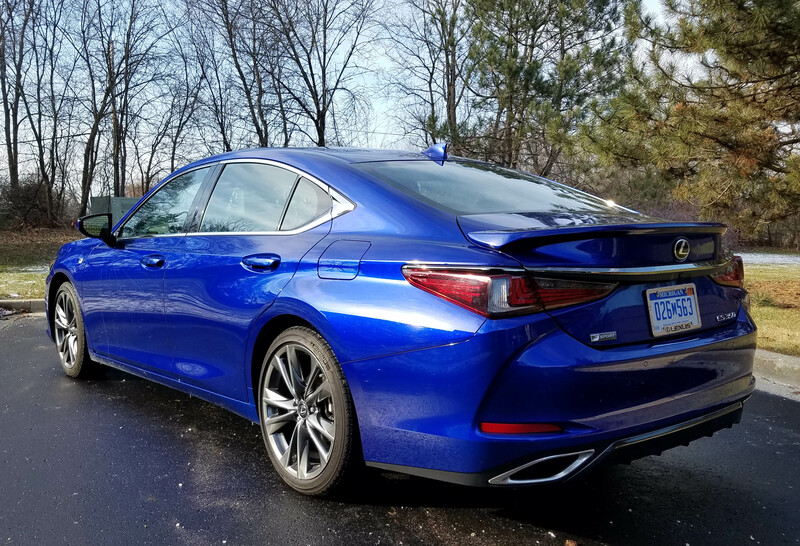 The test car, and the trim levels not in hybrid form all feature the venerable 3.5-liter V6 that has been powering Lexus models for years. Always improved a bit, it now makes 302 horsepower and generates 267 lb.-ft. of torque. That doesn’t make the ES a rocket, but it is quick to highway speeds and gets there smoothly with the help of an 8-speed automatic. Go the hybrid route and you get the V6 plus 176 horsepower via the hybrid electric system and hybrids always give you more pop off the line as electric power is instantaneous. Handling is fine. The car is easy to drive and turns into corners well and is simple to keep centered in a highway lane. Steering is relatively heavy and does not feel as precise as a true sport sedan. But bump the drive mode from Normal to Sport or Sport + and the steering effort firms up, almost too much in the Sport + mode. Eco mode also is available when you want to go light on acceleration and save fuel. Ride is luxury car smooth and well controlled, as it should be when you’re riding on a 113-inch wheelbase. If comfort is a primary desire for your next car, the ES scores high in that department. This isn’t a soft ride, but feels more on a par with a Toyota Avalon (a sister car) or what us “mature” drivers would consider a Buick ride, not that there’s anything wrong with that. There are MacPherson struts up front and a multi-link suspension in back. Braking, all discs of course, also is first rate, quickly bringing the 3,649-lb. sedan to a halt. But while still shy of 2 tons, the ES does feel decidedly heavy. Its more muscular look also delivers the visual cue that this car is substantial. The test car was a bright Heat Blue, which I thought amusingly named as cool is usually associated with blue, and heat with red. It’s eye-catching, but may seem a bit too bright for drivers expecting a more conservative luxury car color palette. I liked its look, and the fine interior, something I’ve come to expect from Lexus. This one was not flashy, a lot of black leather on the dash, doors and seats, with some gray stitching as an accent. Trim was a brushed chrome on the doors and dash with brushed black console trim and partially on the center stack. The interior is roomy, plenty of space for five full-size adults with oodles of rear-seat legroom. Seats are well proportioned and supportive both front and rear. Front seats are powered and there is a power lumbar support, however, it does not adjust up and down. That’s a pity as the inflated lumbar support hit me way too high in my back to be comfortable. So I deflated it to be less bothersome. Wisely Lexus provides three-level heating and cooling to the front seats, something a few car makers are still charging extra for. 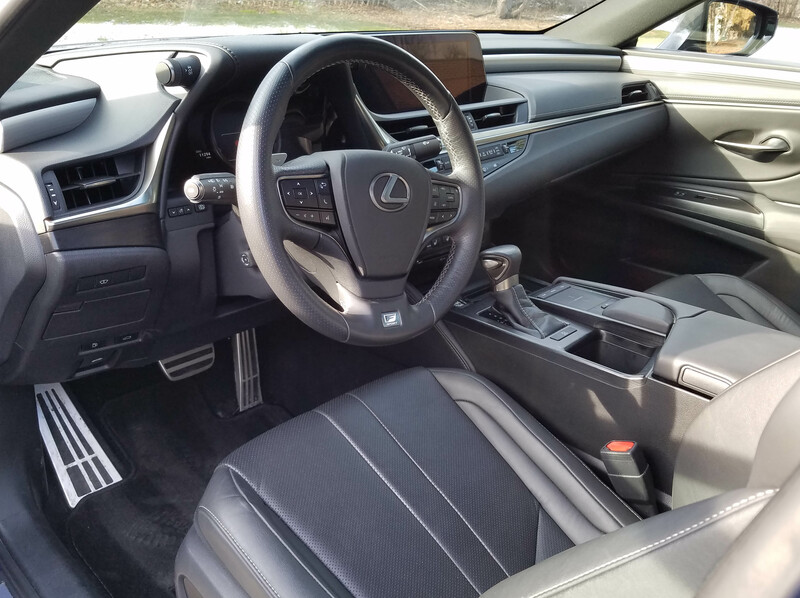 However, the heated F Sport steering wheel, a thick leather, is $180 extra. I vote for the heat. On the bright side, the ES features a power tilt/telescope steering wheel that makes adjustment easy. And overhead is a sunroof and visors that flip and slide. Dash layout is good too and I particularly like how Lexus has incorporated its wide 12.3-inch infotainment screen into the dash’s top. It looks like a part of dash, not an add-on that sticks up like an iPad that someone superglued to the dash. There’s an adjustable main dash gauge cluster, which is fun to play with, but really not necessary. I like the buttons across the dash’s center stack for climate controls as they are necessary and now easily accessed, not via the infotainment screen as many luxury makes are doing these days. 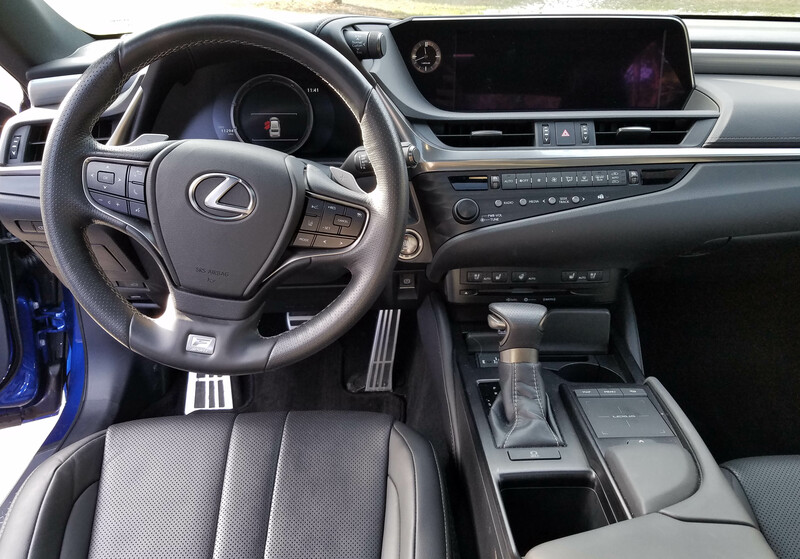 However, there’s that icky Lexus touchpad on the console to mostly control the infotainment screen’s radio and navigation functions. It’s awkward at best and should not be used for tuning while driving. It’s distracting. Luckily there is a volume knob on the dash and volume buttons on the steering wheel hub. While whining, I’ll mention the ES’s large A-pillars, which cut side visibility a bit. But there is a full bevy of safety devices from adaptive front lighting, park assist sensors, rear cross-traffic alerts, lane change assist and blind-spot warning. A pre-collision braking system could also help in a possible front-end collision and sensors will detect pedestrians and bicyclists too. 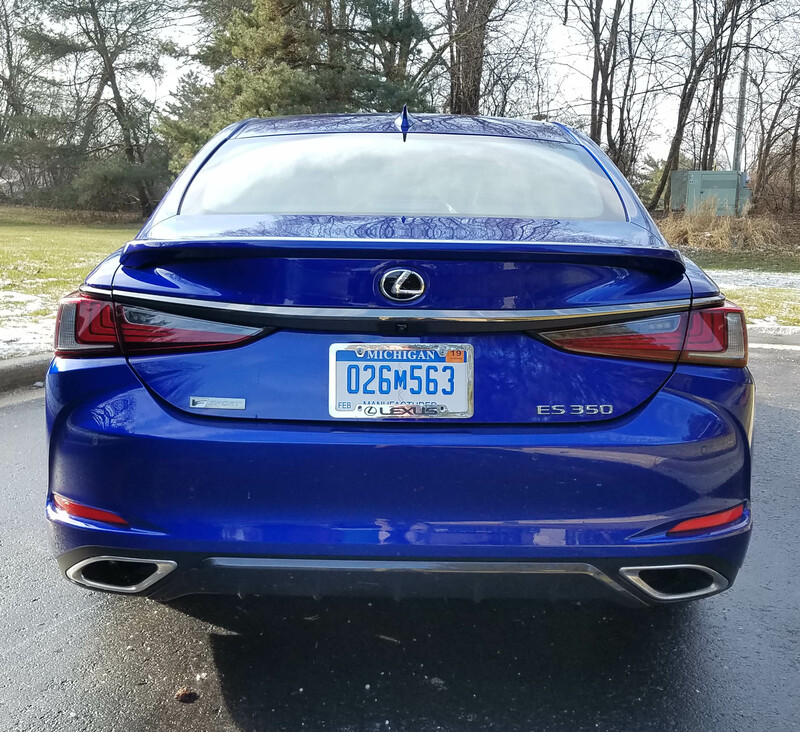 From a practical travel standpoint, the Lexus has a cavernous trunk at 16.7 cubic feet, with a pass-through, but the rear seats don’t fold. The test car added a few options too, including a head-up display for $500, floor mats at $280 and a navigation system for $1,920. That seems exceedingly high considering you could just plug your phone into the many outlets and use that for nav. Base price for the F Sport is $45,060 (including delivery) and the test car checked in at $47,940. 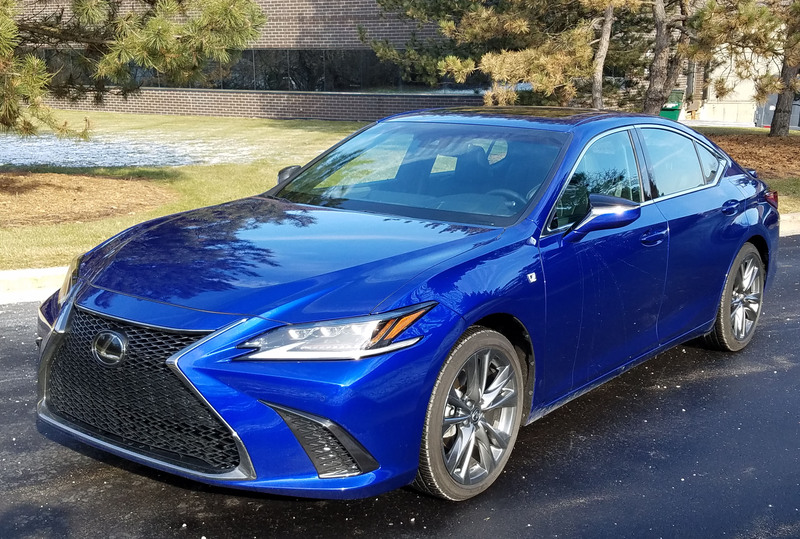 A base Lexus ES 350 begins at $40,525 with delivery, while the base ES 300h hybrid lists at $42,335. It’s rated at 40 mpg city and 39 mpg highway. 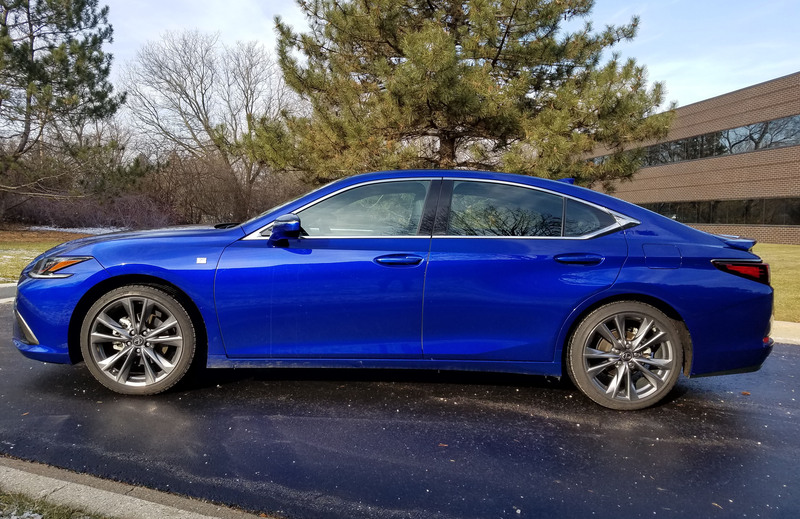 There also are Luxury and Ultra Luxury trim levels for both gas and hybrid powered ES models, the 300h Ultra Luxury setting the high-end bar at $45,985, delivery included. 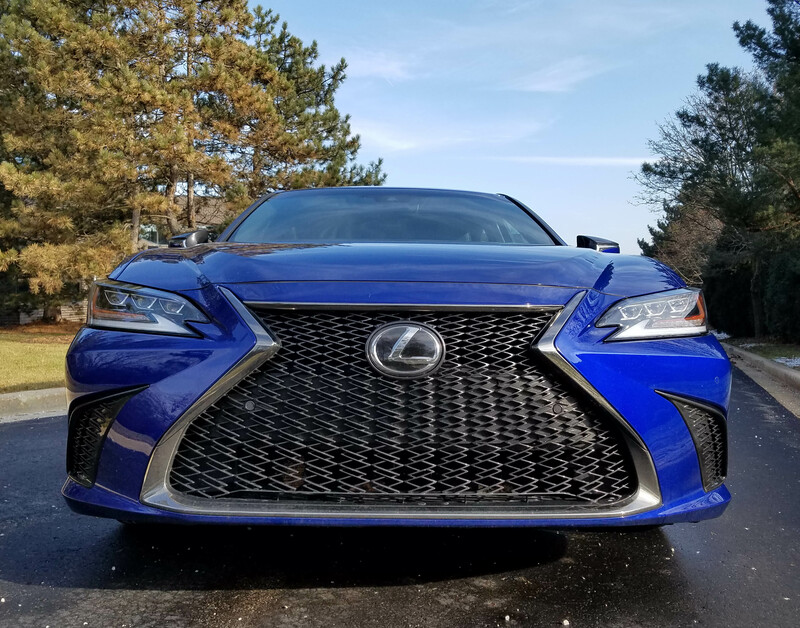 If you want a performance-oriented luxury sedan there are some better choices, but if you want primarily luxury, with a little performance for days when you’re feeling sporty, well, the ES 350 F Sport is what you’re after. Hits: Stylish sedan with good power, decent handling and comfy ride. F Sport adds sporty visuals, plus 19-inch tires. Heated/cooled seats, heated steering wheel, comfortable seats, power tilt/telescope steering wheel, sunroof and full on safety devices. Misses: Awkward touchpad tuning for infotainment, car feels heavy and has large A-pillars.